Enjoy Western style fun for everyone! Get ready for some modern western style family fun! It’s time for the annual Wayne Wilson Children’s Charity Rodeo & Carnival in Cave Creek. This event features something for everyone, from the youngest to oldest, so come and enjoy your selves WESTERN STYLE and help raise money to support the youth in our community. 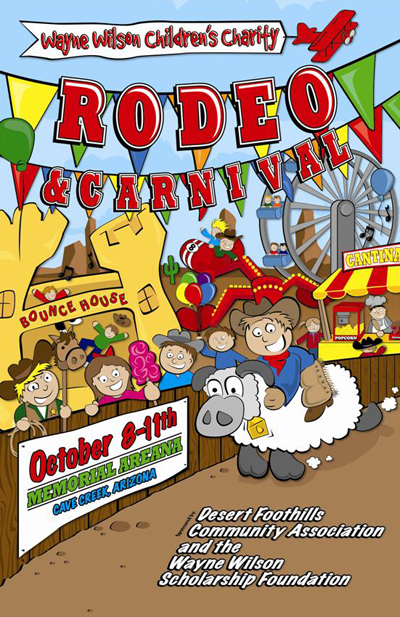 Wayne Wilson Children’s Charity Rodeo & Carnival is an Annual event in the Cave Creek area that supports the needs of our community’s youth through higher education, sports and learning in a family friendly environment! This Rodeo was started in honor of our long time “Rodeo Boss” Wayne Wilson. Wayne believed every child in our community deserved an opportunity to become successful and have a better life than his parents. To this end he believed every child deserved the opportunity to get a college education. Following in his footsteps, his children started the Wayne Wilson Scholarship Fund to grant scholarships to college bound students seeking degrees in animal husbandry and welfare. To further his wishes, the Desert Foothills Community Association began the Wayne Wilson Children’s Charity Rodeo & Carnival with a goal of support our community and its youth’s needs. Charities supported, beyond the above scholarship, include the Desert Hills Food Bank, Ride Rank for a Cure (Cancer), Cowboys for Kids, Starlight Foundation, Queen Creek Junior Rodeo, Arizona Wrangler Junior High School Rodeo and several local area elementary schools and after school programs. Memorial Arena is located at 37201 N. 28th St., Cave Creek, AZ. For more presale savings buy a family pack (2 adult tickets, 2 child tickets and 12 carnival ride tickets) for only $30. To purchase tickets by mail send your check to Desert Foothills Community Association, P.O. Box 647, Cave Creek, AZ 85327 or buy tickets online at www.cavecreekrodeo.com by Sept. 1st. Call 480-488-4043 for more information. Gates open to public at 12 p.m., close at 10 p.m.
12 p.m., close at 5 p.m.